Learn about the direct links and where can you share them. Once you publish your flipbook, you will get a direct link to it. You can share this link with whomever you want. 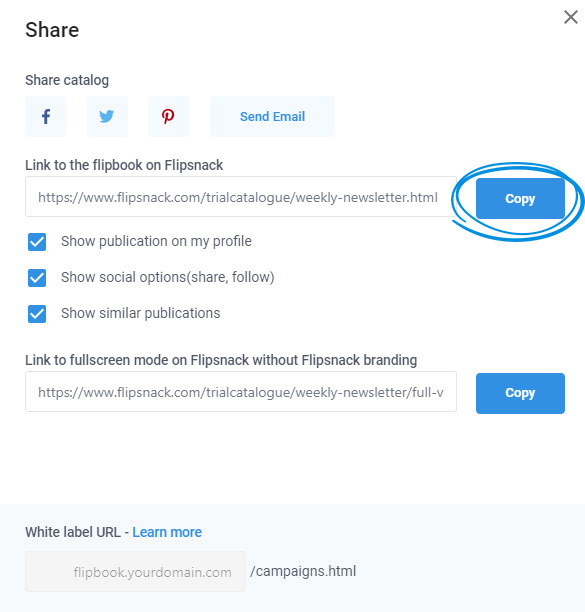 It will open a page that is hosted on Flipsnack. To get the direct link, go to My Flipbooks, hover your mouse over your flipbook and click on the Share button. A pop-in window will open and right below the preview you will see the direct link. In order to copy it, all you have to do is click on it. This will automatically copy the URL to your clipboard. Now all you have to do is paste it anywhere you want. Click here to see how you can share your flipbook in full-screen.